Paige VanZant just won UFC. 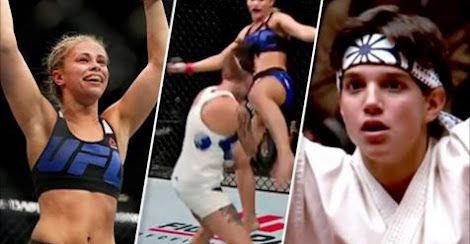 Her KO of Bec Rawlings at the Rogers Arena in Vancouver, Canada, was a sight to behold. It also bore a striking resemblance to 1984’s The Karate Kid. Strawweight fighters Paige VanZant (7-2) and Bec Rawlings (7-5) faced each other in Paige’s first fight for eight months. The first round was relatively uneventful with VanZant using her mobility and broad leg sweeps to keep the two apart. Bec Rawlings was undeterred and kept coming for VanZant moving the fight all over the ring as the two played cat and mouse. It’s so satisfying to see someone pull of a really ambitious move in The Octagon – but the cinema reference really is the icing on the cake. Which hopefully means there will be plenty more stunning moves in the future.